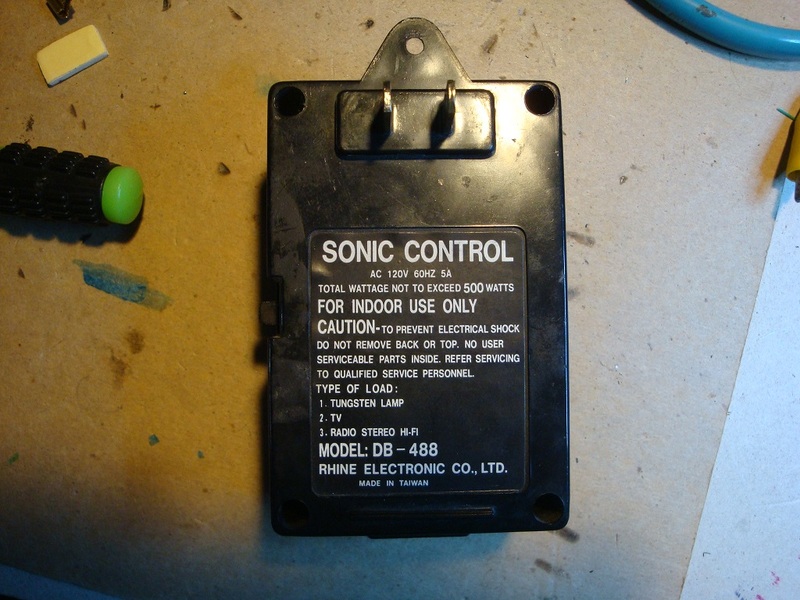 History: I bought two of these devices years ago when sonic switches were all the thing. After about 15 years or more, one of the units died. I don't remember the failure mode, but I threw it out and kept the squeeze device so I could have two with the remaining unit. Problem: About six months ago, the second unit began to turn on for no reason. 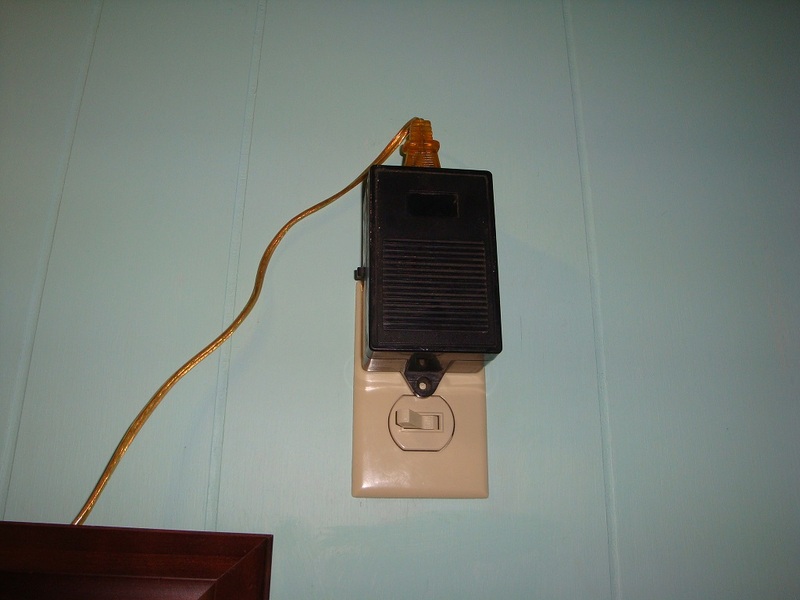 A month or two after that, it started switching between on and off at a very high rate - about two or three times a second. I took it out of service and was thinking of recycling it. Taking it Apart and Saving Parts, 2/5/2019: I decided to take it apart to see if I could save any parts. I was thinking that the relay would be good, and perhaps a few other parts with long enough leads. 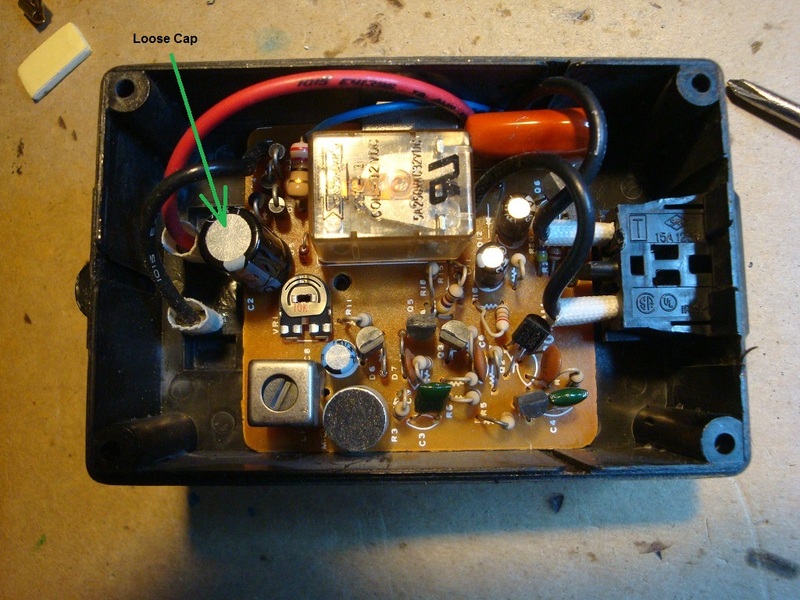 When I removed the circuit card, I started pushing on things and noticed a 470uf 16V cap was loose. When I looked closely at the circuit card solder connections I saw that both leads were broken off of the card. One looked like the foil was ripped off the card as well, I also noticed that this had happened to another part where I had added some wire to reattach the part to the original trace. The Fix: I first soldered and tested these connections and found that both were working. Not believing that the one with the ripped foil was a good connection, I added a wire from the lead to another connection on that trace. 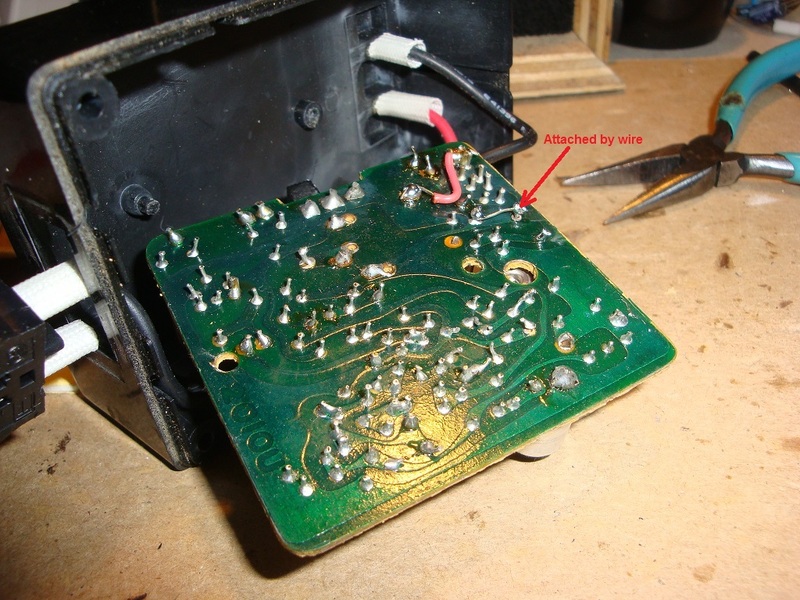 In the photo below it is pretty clear that one of the connections is soldered to a wire and not to the trace on the board. Tests: The unit was put back together enough for me to plug it into an AC socket and power it up. First, the unit no longer oscillated between on and off at a rate of two or three times a second (2 or 3 Hz). Next, the box was tested by using the squeeze device to turn the unit on and then off a few rimes. Everything seemed to be working correctly again. Lesson Learned: I wonder now if the unit I threw out years ago could have been saved. I guess I didn't inspect it as well as I did this unit. On the other hand, seeing that I had repaired this unit at least once I probably took the other unit apart and at least tried to find any problem. Whatever the case, I've learned that once again many things fail because of simple problems and if we just look for them we may be able to fix the device with almost no cost involved. 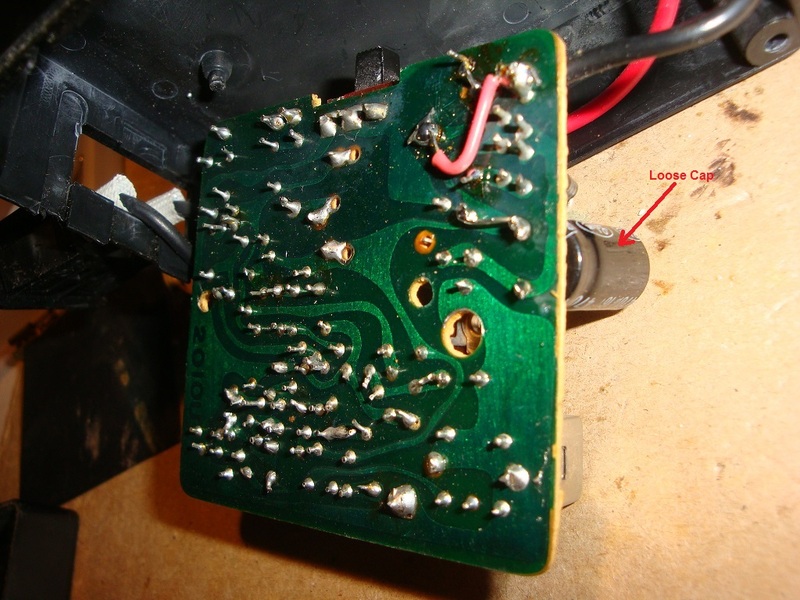 A little wire, solder, and time was all this repair took. So, if you are at all into fixing or hacking things, don't forget to at least take the defective device apart and have a look. Who knows what you may find: some good parts to use for another project or a loose part that just needs to be reconnected to the circuit in order to make it work again.